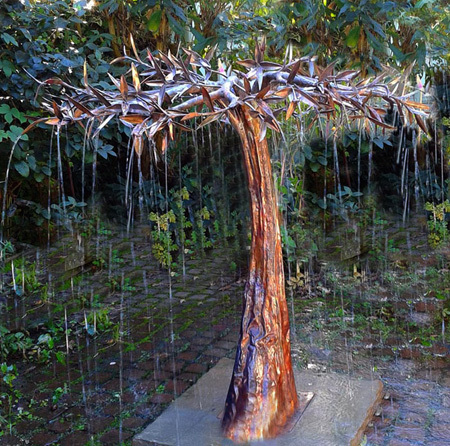 A design based on an Olive tree, the Rain Tree copper water feature is designed to look natural and life-like. Just an ancient tree caught in the rain. The gnarled trunk leads up to seven main branches. These in turn are further branched off to give a very natural shape. Approximately 300 leaves of varying shapes and sizes make up the canopy of this copper fountain. Each one is cut and formed by hand and individually fixed into place. The copper is left in its natural state, to benefit from the constant changing patinas, building up over many decades. This process allows the fountain to blend perfectly into a garden, integrating, without dominating.